With all the warnings on the low acidity scariness that is the carrot this month, I decided to not stray too far from a published recipe found in Well Preserved by Mary Anne Dragen. I really wanted to have something on hand that would be a good accompaniment to have with some charcuterie. Haven't been able to try them yet, but I hope to report back good results in a few weeks. Combine the water, vinegar, sugar, salt, and peppercorns and bring to a boil and simmer for 5 mins. 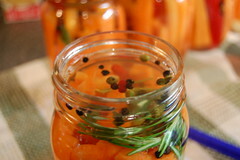 Take 1 hot sterilized jar at a time, add 1 garlic clove, 1 chili and 1 sprig of rosemary. 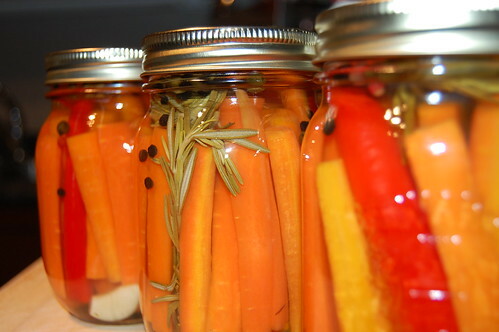 Pack the carrot sticks tightly into the jars standing them upright. Pour the liquid in the jars and leave a 1/4" of head space and hot water process for 15mins. I am definitely going to try this - I love the chili-rosemary combination! This recipe looks very promising. How did they turn out? 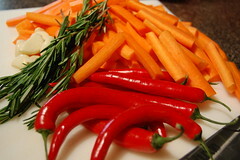 Hi Livia, they were pretty spicy, which was fine for me but a bit too hot for my wife. I would go lighter on the rosemary if I made these again.